Every Landmark Bus Lines employee including drivers, mechanics, dispatchers and office support staff is dedicated to safety. This commitment includes our shop staff's adherence to our Preventative Maintenance program. Our Easy Bus software tracking system makes it easy for our staff to ensure maintainance is performed on all of our vans, school buses, limos, transit buses and coach buses in accordance with strict Ministry of Transportation regulations. 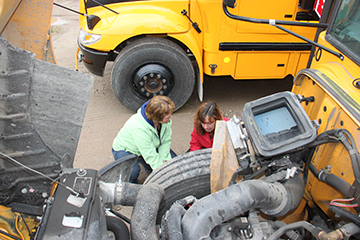 Under the Commercial Vehicle Operator's Registration Certificate (CVOR) program, brakes are inspected every 3 months and a complete inspection completed every 6 months. In between, regular servicing and maintenance is performed. Our passengers can count on a safe and comfortable ride each and every time aboard a Landmark Bus Lines vehicle.